Needs to have spawns broken out into groups with aggo assigned and the pictures need to have the groups labeled on them. Blitz instruction on the second pocket states that you can destroy the ships that are furthest from you on warp in, but that you shouldn't move or use drones. However, after destroying the control tower on warp in (prevents any respawn/second wave, although not sure I needed to) I moved to sentry drone range of the furthest pocket (60-90km with Warden II's), and took them out. 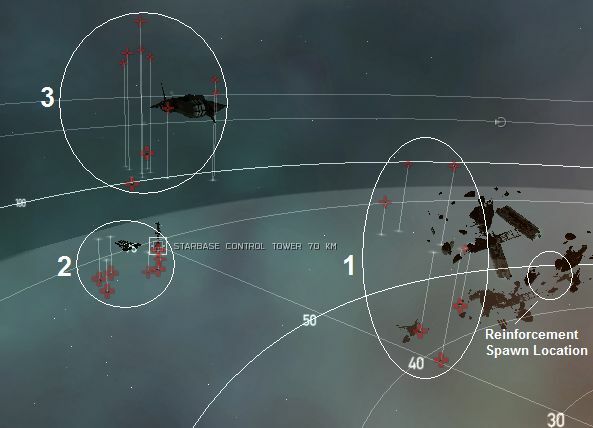 3 battleships aggro you, but the remaining rat groups target your drones. But as they are sentries its easy to scoop to drone bay when drone shields are getting low, then deploy them again more or less immediately. Using this method it takes only a few minutes to rip through the furthest pocket of two BS's and a couple of frigs, and complete the mission. Hope this may be of use to drone users? The Dire Pith Annihilator in the second pocket causes nearly complete stage aggro. But when this one is killed, and you warp in/out again, you can do the whole pocket in small groups. killed both bs's first, mission wasn't completed. Finished off all of group 3 and mission was finished. Blitzing this mission worked perfectly. You warp-in 5000km away from the gate. Approach and activate, no problem. In the next pocket the two other groups didn't mind me shooting across the site to kill group three, they left me well alone. I used 3x Kin, 1x Therm hardeners on a Raven and Kin missiles. pulled full stage(Dominix) in the first pocket: 2xKin; 2xTherm hardeners, 1 EANM, 1LAR, 1MAR. Worked good for me. Got Pith Exterminator in group one in the first pocket, jamming. Annoyingly it was the top bounty so I just went for the gate. You can definitely tank the entire first room in a Dominix. I had 2x kin II, 2x therm hardener II, 1x dc II, 2x LAR II. 3x CCC rigs, mid slots with cap recharger II. Only had to run my second LAR II for a few minutes. For those who are trying to kill all the rats, I accidentally found something that may make it easier. In the second room, I came very close to group 2 while attacking group 3 (within 30 km). I was aggroed by all of group 2 except for 3 BSs, effectively splitting the aggro. Among the BSs that did not aggro me was the Destroyer (highest bounty trigger). I have not tried this mission another time to confirm that it wasn't just a fluke, so use it at your own risk. Full stage agro + triggered spawn on second pocket does insane damage, in my 1484dps tanking nighthawk (kinetic/termal) they slowly broke my tank. Done with a Drake (70% heat, 83% kin res, 2LSE II, 3SPR II, 2 purger rigs). No tanking problems, but taking the BSs (Pith Destroyer) down with T1 Heavies takes ages. Kill order (trigger last always): group 1, reinf, group 2. Pocket 2: group 1, group 3, group 2, reinf. The group 2 in pocket 2 didnt aggro even when I went right up to about 30km of them. Reward and bounties added up to about 20m. JuniorChief, why should someone do this? Its not making sense at all in PvE. Purger Rigs give you a high shield recharge, Screen Reinforcer Rigs can just help against 1 specific damage type. If you take a standard Drake fitting with medslots 2 LSE t2 and 4 specific hardeners t2 (for Gurista I suggest 3 kinetic, 1 thermal!) you wont get that much more resistances with Screen Reinforcer Rigs, but you will be crippling your shield recharge without Purger Rigs. Completed Omen Navy Issue. Read comments as well as mission. Always kill ships smallest to largest; you can tank a stage full of battleships, but the smaller ships will hurt you (your insane incoming dps will always involve them vs. the battleships, and expect to do pathetic dps against things like: Dire Pithum Inferno--resists EM 90%/Th 79%/Kin 72% with very high shield repairing). Note all the various comments regarding proximity aggro--this will become an issue. Suggest AB, NOS (for cap stable guns), 3x kin, 1x therm (or even another therm if truly needed), at least Amarr med. repper. Make sure to get the scram/webbers out of the way as soon as they become an issue--drones or Scorch. Mission not impossible, but certainly a pain. Completed in Abaddon, one groupe at a time. Scorched'em all. Armor drop at 50% because I used 1 energized reflective membrane II + 1 EANM II instead of 2 EANM II :S . 1 LAR II, 2 hardeners II(1 kin, 1 ther), 1 HS II and 1 CPR II, in the remaining low slots. Pith Destroyers were a pain to kill, they were orbiting at 50 clicks. Any ship with a low sensor strength is not advisable in this mission because of the ECM. You can just about get away with a drake (19 SS) by using FoF missiles when jammed, but other BCs will struggle, particularly Minmatar (16 SS). A sensor strength 22+ is advised to reduce the amount of time you are jammed. Completed in Apoc Navy issue with 8 Mega Pulse lasers II. Armor drop was minimal with 4 harderners II (2 kin + 2 therm), 1 EANM II, a LAR II and 2 HS II. My optimal with Scorch crystals was 56 clicks because of the bonus to optimal range of the ship and gave me more DPS than the Abaddon. Jammed 3 times only. Thought about using a passive shield Ishtar for this as you just get agro and release the hounds... jamming is pretty irrelevant then. Hard mission. It is manageable if u watch your agro and follow the tips. Pocket 2: Snipe group 3. no pocket agro. used drones in first pocket on group 1. They pulled aggro from group 2 and when i scooped them back into my hold group two had aggroed me. So i pulled full aggro on the first pocket in a raven, a bit hairy but i managed to tank it. Ran this mission with my nightmare snd i noticed fitting backup sensors reduced the number of times i was jammed. Jamming in the 2nd pocket is crazy. Equiping an ECCM will help greatly. This is a very common, and incorrect, notion about Guristas/Caldari ECM. For all intents and purposes, NPC EWAR is not bound under the same rules/mechanics as the player variants. Basically, you can't counter it past killing the ship, not getting hit by it or using a fleet member to help be the decoy. This applies to all NPC EWAR, and not just ECM. Completed in navy Issue Apoc. Used a ECCM module (best name) giving me 49 points. I have not been jammed at all. Got jammed 3 times in a Tengu while running this mission. Done in Ishtar several times. Over the last year, it's the ship I use for this mission. Shoot the triggers once each in both rooms, then orbit something and let your drones go slap-happy. Dual-rep armor tank with AB cap stable. Please replace "jamming" with "dampening". Had full room agro in pocket 2 while attacking group 3. Tanked only with non stop domi shield booster and cap booster on low sp raven. Take some fof with you to kill scramble frigs, jamming is rather strong. This f*cking mission is ridiculous. That much jamming is a f*cking joke. I wont even bother next time. Even a Marauder can blitz this easily. Done several times in a Kronos. 1x low 1x med sensor boost, just shy of 34ss. Fly through gate, attack and kill group 3. Focus down possible jammers (not always there). Not jammed once, no agro from groups 1,2 as stated in guide. Warning: dont take full agro unless you're in a t2/3 cruiser or a bs that's exceptionally well tanked AND jam resistant at the same time. I think they reduced the jamming a lot, for this mission. I just did it, and I only got jammed once in the first pocket. Not at all in the second. Pretty decent mission bounty-wise, I got about 18 million ISK killing everything, which took me about 40 minutes in a CNR. Confirmed alot less jamming. However I did notice a bug where exterminator wrecks will try to jam you if you salvage them! I'd also like to confirm that the insane amount of jamming on this mission has been fixed by CCP (thank GOD!!!). Every so often though you'll get one or two Exterminator/Eliminators in room 1 and/or room 2. However, overwhelmingly you'll only encounter non-jamming battleships. Group 2 in Room 2 DOES have 2 elite jamming cruisers every time I've done this mission lately. So, mostly the jamming is gone. Sometimes you encounter a little bit, but it's fine now. I dont got a highest bounty trigger in 2nd pocket. 4 bs(conquistador 993.750.00 bounty on all 4), 5th bs (destoryer 881.250.00 bounty) so what ones the trigger. trigger for me was the conquistador flying apart from the rest. Killed all in a shitfit Raven, Very easy if you foillow the tips, bring a drone augmentor definitely. I had 2 Dire Pithum Killers in Pocket 2 group 2. These cruisers jammed me once. If you have a ship with a high sensor strength like a Tengu, you probably won't ever even get jammed. Looks like CCP intentionally or not changed this mission. First pocket its same, just go to the warp gate and jump to the second pocket. Now in second pocket regardless what group you aggro after few sec there will be full pocket aggro. Tested 5 times and each time i was far away from grp 1 and 2 (min 55km and up) but once i start shooting at grp 3 i got pocket aggro. Only difference i saw was ships from grp 2 - 2 out of 5 times 3 BS from same grp didnt aggroed me (2 of them with highest bounty). If anyone have encounter same thing please post it, with still heavy jamming and 2 frigates with web/scram someone can easy get into trouble. Done it in a tengu. Very easy mission. Done it in a vindicator. Fitted an ab to get close to the reinforcements in pocket 1 while cleaning the rest of npc's. Pocket 2 I just burn ab till I get near the station by 20km and kill all the way till I got there. Some of the rat names have changed, but I just did this mission, and in Pocket 2 I targeted one of the BS rats, and only that group aggroed when I started to attack. After they all popped, I targeted one from Group 3, and only that group aggroed. After they all popped, mission was flagged complete. 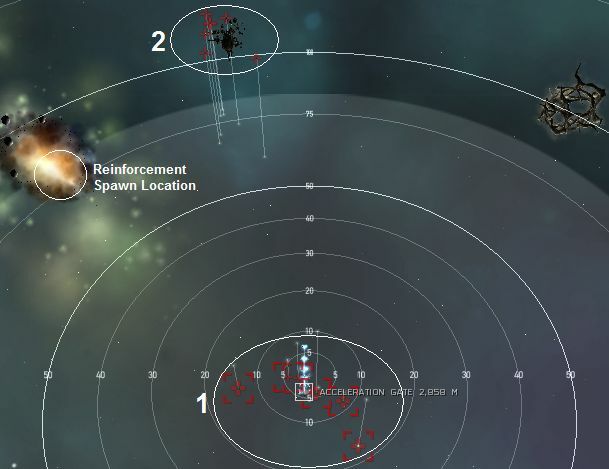 Pocket two: Highest bounty battleship was not the trigger. I had a Pith Conquistador with higher bounty and it was not the trigger. Maybe Pith Conquistador is not a trigger. Really tough mission for a sniper Raven. Destroyers hit you at 200 Km and the loot is not great! I will skip this next time. Used a Caracal, stayed at range (~65km) and never got jammed. Mortifiers in Pocket 1 forced me to dock once to reload shields as I wasn't fitted for Thermal resist. After that my shields never dropped below 50% the rest of the way. This is a middle finger mission for amarrian ships, doeable though! Just tried to blitz this and it didn't work. Landed in Pocket 1, 3,500m from gate. Didn't shoot anything, popped into Pocket 2. Started locking/shooting everything in Group 3, keeping track of what aggro'd me and what was in the group. Popped the last ship and........no completion. Started locking and popping Group 1. No aggro from Group 2. Finished them (no completion) and started on Group 2. All 5 BSs were Pith Destroyers. Killed the 2 Elite cruisers, then one of the BSs. Started on the 2nd BS and the first Spawn arrived so no idea what the trigger was for that. Popped the control tower so Spawn 2 never appeared. Got the completion after killing the last ship from Spawn 1. Just got the same mission again, minutes after turning in the last one (same agent/system/toon/etc). Tried to blitz it again and again it didn't work. Same procedure, warped into Pocket one (6,500m away from the gate this time). Went through the gate without shooting anything. Landed in Pocket 2, locked and popped all the ships in Group 3 and didn't get the completion flag. Got back in, finished Group 2, no completion. Started on Group 3, beginning with the frigates and one of the Elite Cruisers. Then the 2 Pith Dismantlers, leaving an Elite Cruiser and the Pith Extinguisher to the end. Took out the 2nd Elite Cruiser and finally the last BS and the mission flagged as complete. So, the "blitz" is to enter Pocket 1 and jump through the gate into Pocket 2 (no need to shoot anything). Then kill all the ships in pocket 2. Next time I will try going Group 1, 3, Control Tower, then 2 and see how that works (in case going for 1 aggros another group or something).